As housing is adopted to minimise the environmental impacts of farming activities in New Zealand, it becomes important to investigate the impact of this on the body condition of cows as a predictor of animal welfare. 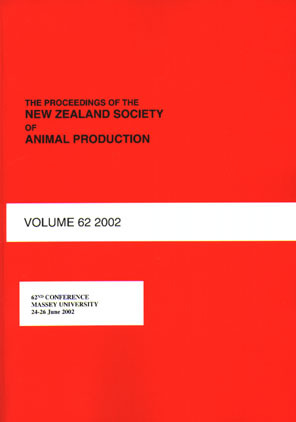 The P21 project undertaken at Massey University’s Dairy 4 recorded the body condition score (BCS) and live weight (LW) of cows either under duration-controlled grazing during sensitive periods (‘housed’) or standard feed-pad (‘standard’) system. A total of 10,350 BCS records and 10,950 LW records were available from 978 cows over three dairy seasons (2013-14 to 2015-16). Random regression curves for daily BCS and LW were modelled using a 5th order Legendre polynomial. Data were analysed with a linear model, which included the effects of system, season, the system by season interaction and proportion of breeds (Jersey and Friesian), and cow age fitted as co-variants. The BCS was greater in 2014-15 than in either 2013-14 or 2015-16, (4.48 vs 4.33 and 4.28, respectively). The BCS of the housed and standard cows were significantly different (P <0.01) in 2013-14 and 2015-16. Housed cows were heavier than standard cows in both 2013-14 and 2014-15. These results indicate that housing of cows could improve on their BCS and LW.